No. 30, Jalan TPK 1/6, Taman Perindustrian Kinrara, 47100 Puchong, Selangor, Malaysia. 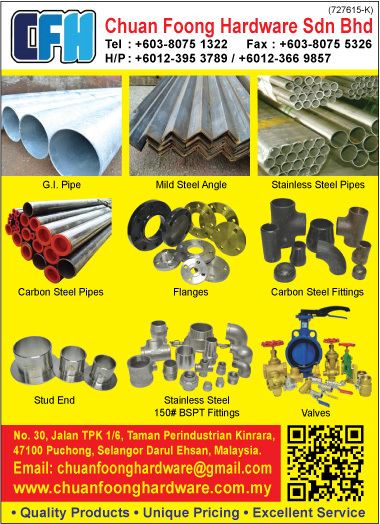 Devoted to providing the best of quality pipes and fittings, pledged to be one of the most complete suppliers of piping serving the diverse industries and usages with excellent, reliable and efficient delivery channels, Chuan Foong Hardware Sdn Bhd offers to you the piping solutions like no others. Established in 2006, our company has what it takes to be the proficient supplier in the piping products and fittings, bringing customer experience to the next level of satisfaction and contentment. Positioned strategically in the Taman Perindustrian Kinrara, Puchong, Selangor, the forefront of our modern warehouse is well stocked with a full range of piping and fittings catering to multiple industries use. The founders and directors, namely Mr. Koo Kiem Hou, Mr. Koo Kiem Meng and Mr. Koo Kiem Fwei are instrumental in dominating the overall direction of the company, lending their best of experience and know-how of the industry into Chuan Foong Hardware. Financial and administration aspect of the organization is led by a certified Chartered Accountant Pang Cheng Leong, single handedly bringing reforms into the company’s internal operating procedures with backing from a team of experienced employees. Engaged and dedicated in what we do, our company has been offering quality products at best pricing and services comparable to our competitors. Our products are distributed throughout Malaysia. Our products include a large selection of pipes and fittings of diverse makes. Catering Oil and Gas industry, a vast range of valves, gaskets and flanges are procurable at at Chuan Foong Hardware. Some of the series such as ‘Sch 40 Buttweld Fitting’ and ‘SGP Fittings’ are also well-stocked here.